It's another year, and Christmas is just around the corner. Remember last year? 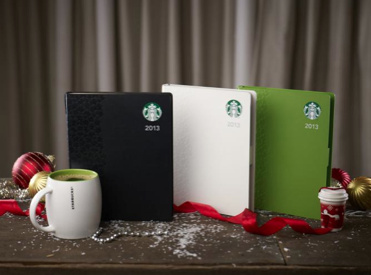 When we had the Starbucks 2012 planners, well I guess you got it all filled up and well now, roaring to get the new Starbucks 2013 planner right? As part of the Filipinos' Christmas tradition, from Noche Buenas to giving of aguinaldos, to the endless rows of sweet hams seen at every homes, the tradition of annually owning a Starbucks planner has indeed gone a long way. I remember the first few years when I started collecting stickers to quickly fill up the Starbuck's card and was even buying drinks for my friends so that I could complete it faster, and now I'm back to my old habits again, but well, my friends are not complaining. Fuego, is not your typical restaurant bar lounge, it serves up insanely delicious Mexican delicacies, fine tasting creations and spices up with a kick of alchohol with their tequila mixes and concoctions. Take a sip of Aqua Fresca, as shown above is like fresh melon juice but lighter in taste, very refreshing after a day's work.